This article was originally posted on November 6, 2018. Are you trying to elevate your a cappella group to the next level? Or are you just trying to get your group excited about the music they’re singing? Either way, a good arrangement can make all the difference in the world with your group. We talked to Ben Spalding, director of award-winning high school group Forte, about how to bring out the best in your singers with the arrangements you use. How do you find arrangements that fit your group’s style and identity? In high school and collegiate a cappella groups, where membership shifts every year, the group’s identity is always evolving. The director can (and should!) help shape that identity, but the singers are the foundation. One of Ben’s practices is to create a playlist on Spotify or Apple Music before the school year and share it with his students. They can add songs that they enjoy, can sing well, or think could fit the group. Even if he doesn’t use any of those songs, they give him insight into his students’ strengths and interests and help him choose repertoire that suits the group. What’s your process for teaching arrangements from first look to memorization? Whenever possible, get the arrangements in advance. Then distribute them to your students through Dropbox, Google Drive, or another file sharing service. If you require them to learn their parts before the school year, your group will have a head start and can devote more time to learning new pieces, workshopping current pieces, and developing their performance technique. Even distributing one or two songs to your group early can make a difference. Ben holds a multi-day “Forte Camp” before school starts each year, where he brings in that year’s group for intensive practice and preparation. The students are required to know their parts when they arrive. 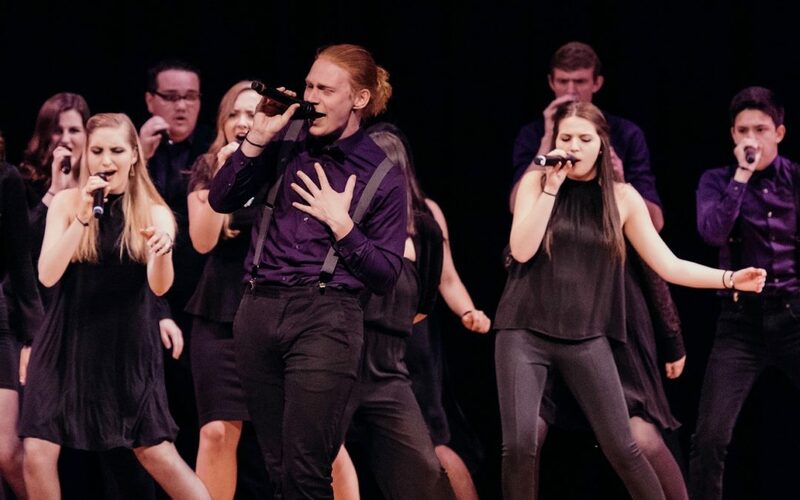 The high standard helps motivate his students, and it’s one of the factors that has contributed to Forte’s 2016 ICHSA win and four second-place finishes. Avoid teaching notes in class as much as possible. Every director knows the struggle of playing a part repeatedly for a student who hasn’t learned it. Even when Ben obtains new songs during the school year, he requires his students to learn the arrangements on their own within the next week or so. Practice tracks – with actual voices or even just MIDI piano – are very beneficial here. The “one-on-a-part” quiz is a useful tool – taking one student from each voice part and having them perform the arrangement together – but it’s not always necessary. Running through the piece as a whole group once it’s learned will help the learning process. All of these tools contribute to a high standard of learning – one that you can implement with your own group. With Forte, it usually takes five days of rehearsal to bring the song to performance readiness. Watch the full interview with Ben Spalding here! How can a director guide their students in creating arrangements? Forte once had the opportunity to sing at a radio station with pop artist Andy Grammer. However, they had less than a day to come up with an arrangement. With only a few hours to arrange and rehearse together, they created a simple arrangement and performed it with Andy the next day. One way to work on creating arrangements with your students is improvisation. Start with the bass improvising a simple bassline and go up in parts, adding layers to create a cohesive arrangement. The first results probably won’t be pretty, but this exercise gives students an opportunity to create something unique, and to do it as a unified group. You can’t wait for an opportunity to arrange – you have to just do it. If you don’t know where to start, the AEA offers a personalized advice from experts, free arrangements, and more as part of our membership program. Annual events like the National A Cappella Convention give you and your group the opportunity to meet, learn from, and perform for industry professionals. Join today! How can a director guide their students in writing original music? Among other accolades, Forte is the first high school a cappella group to release an album of original music. Ben directed this project because he had students in the group who were already writing songs. Look for your students’ strengths and develop them. If students are interested in songwriting, you can nurture that and turn it into a huge asset for the group and for the students themselves. If you want to develop your students’ skills, bring in outside help. Clinicians can work with your a cappella group in many different areas. If you have the budget, bring students to events and opportunities where they can learn and grow. One year, Ben took four of his Forte students to Nashville to meet and write with songwriters. Students need resources to help them grow. If you want your group to improve in any area, it needs to be surrounded by the best people – arrangers, songwriters, choreographers, and so on. Instructors from the “outside” can take the feedback you’ve given a dozen times and present it in a fresh way that has a deeper impact. If you don’t have a large budget, contact us through Facebook to get connected with our team! We can connect you with educators who are passionate about helping a cappella groups grow. The only way to improve is to start. Take a step in the right direction today. This article is based on an interview with Ben Spalding, who is a high school choral director, author, and founding member of the A Cappella Education Association. He’s one of several a cappella personalities we interviewed in our Summer Series. Stay tuned for more articles on what YOU need to know about a cappella education every week. Contact us via our Facebook page to learn more and join our Facebook group to become a part of the community! We’re also on Instagram (@acappellaed) and Twitter (@acappellaedu). Do you want free arrangements, expert advice, and access to professional a cappella events? You can have all of that and more by becoming a member of the A Cappella Education Association. Join us today and help shape the future of a cappella.